I suppose that it should come as no surprise that I don’t share my baking fails with you. But I do have my fair share of them. For instance, I’ve tried some type of tres leches cake a couple of times with not so good results. Recently, though, I decided to give it another shot. And I’m oh-so glad I did. 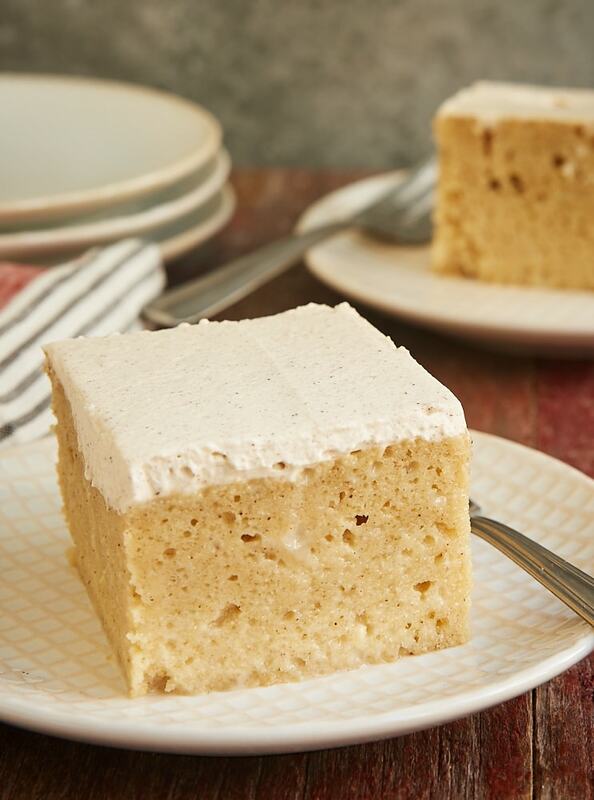 For those of you not familiar with it, a tres leches cake is usually a simple cake that is baked and then soaked with a mixture of three kinds of milk. As you might guess, all that liquid soaked into the cake makes for a very moist cake. It’s so soft and gooey and sticky and just plain good. This beauty is not only a tres leches cake, but it is also a rum cake. Both are traditionally a type of poke cake, where holes are poked over the surface of the cake. 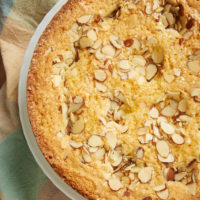 Then a liquid, like the three milks of a tres leches cake or the rum in a rum cake, is poured over the cake and allowed to soak into the cake. In this case, you get the best of both cakes with a three-milk mixture combined with a bit of rum. 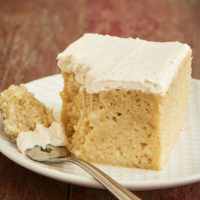 The milk mixture of a tres leches cake more traditionally includes cream, but this one uses sour cream for a little variety in flavor and texture. 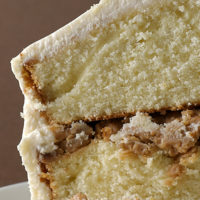 And for a little extra flavor, cinnamon and nutmeg are mixed into the cake, and the frosting is simply a cinnamon whipped cream. 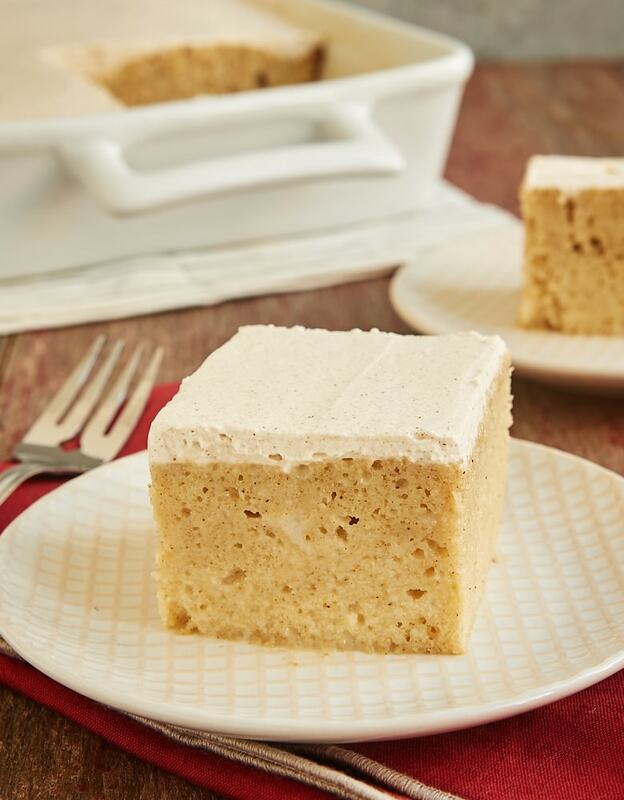 That little bit of spice really elevates the flavor and makes this cake even more fantastic. I’ll give you one bit of advice about getting the cake ready to add the three milks mixture. Don’t be shy when it comes to poking holes in the cake. 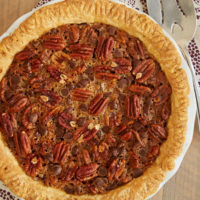 You want plenty so that the liquid has ample opportunity to get down into the cake. After you start adding the milk mixture, you can add more holes if you see any problem spots where the liquid is pooling. And take your time. Don’t pour it all on at once. I recommend using a large spoon or a small measuring cup to add the liquid a bit at a time. Then just give each bit several seconds to start soaking into the cake before you add more. This cake ranks highly on my list of favorite grown-up cakes. It’s perfect for the over-21 crowd who loves dessert. Make this cake for a gathering with friends, a holiday party, or just because! 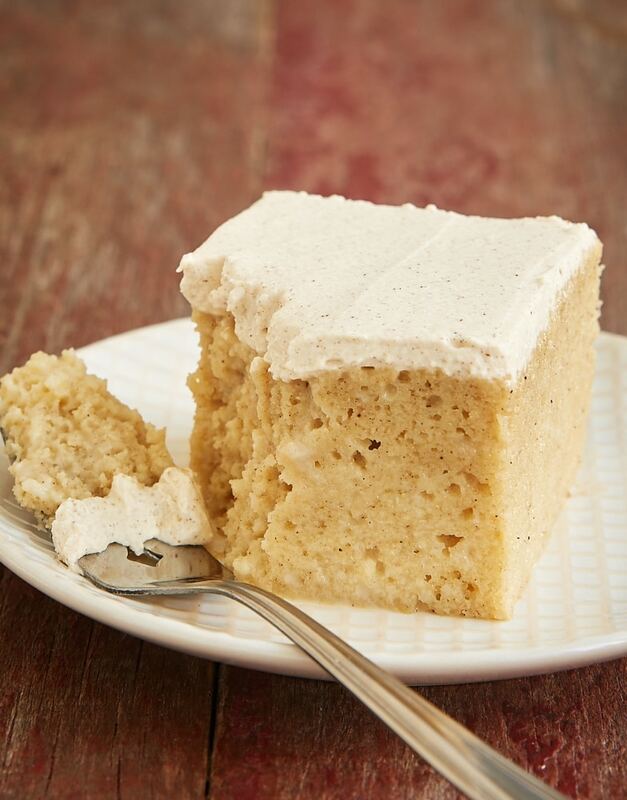 Tres Leches Rum Cake is an amazingly delicious, moist, flavorful cake. 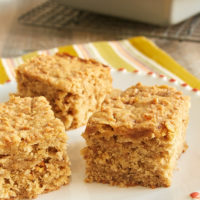 A favorite grown-up dessert! Whisk together the flour, baking powder, cinnamon, baking soda, salt, and nutmeg. Set aside. Using an electric mixer on medium speed, beat the butter and sugar until light and fluffy. Add the eggs, one at a time, mixing well after each addition. Reduce mixer speed to low. Add the flour mixture in three portions, alternating with two portions of the milk. Add the rum with the last addition of milk. Mix just until combined. Transfer the batter to the prepared pan, and spread evenly. Bake 30 to 35 minutes, or until the cake is golden brown and a pick inserted into the center comes out clean. Sprinkle the sugar over the cream. Continue beating until combined. Add the cinnamon. Continue beating until you can lift the whisk out of the whipped cream and a peak that curves downward forms in the cream. This should take 4 to 5 minutes. Spread the whipped cream over the chilled cake. Keep refrigerated. *This is a lot of liquid to soak into the cake, so take your time. I use a large spoon or small measuring cup to pour the liquid over the cake a little bit at a time. As that soaks into the cake, add more liquid and poke more holes in the cake if necessary. If you pour it all on at once, most of it will run down the sides of the cake and not into the holes. Some will inevitably run down the sides, and that’s fine. This cake is best within a day or two of its initial chilling. Thanks for the note about this not keeping. I was going to make it and freeze half (I never need a whole cake at once! ), but this gave me pause. I’ll be sure to freeze half without the milk mixture, and pour half the milk over the other half instead. I make Martha Stewart’s tres leches and love it for its simplicity. The eggs are mixed in whole like this recipe where most tres leches recipes require separating the eggs, beating them separately, etc. , I usually serve my tres leches with my homemade whipped topping on the side. I love being able to freeze desserts, but with this cake freezing wasn’t advised. That said, you don’t know until you try. I froze a couple of individual pieces along with a dollop of whipped cream…. I know!!! However, after defrosting at least a month later, was pleased with the outcome! Truly was amazed. So, there you go! 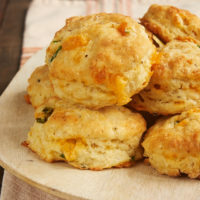 I will definitely be trying this recipe, thank you!! PS: the reason I froze a couple of pieces of my tres leches was because my daughter was away at the time and begged me to save her some. Figured I would try freezing some. Worst that could happen is it would be awful and have to be tossed! 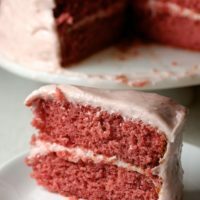 Hi — is there any substitution for rum in this cake and topping, or can they just be omitted without affecting the results? It looks delicious, but I am definitely baking for the under-21 crowd. Thank you! Hi, Cari. I’d probably just omit it. Thanks Jennifer! I’ll give it a try. I made this cake yesterday and I must say I am very disappointed. It was very dry and the liquid did not absorb into the cake. I followed the recipe exactly. I’m just sitting here reading this recipe and I’m confused. Under directions for the cake itself, it mentions alternating adding the dry ingredients with the “milk mixture” to the butter and eggs (Step 4) but I don’t understand where the construction of the “milk mixture” comes in. Step 1 of the “Topping” (which to me always means “frosting” of a cake so THAT’S confusing too) directions mentions combining the milks and pouring them over the (already baked?) cake. So… where is the “milk mixture” from Step 4? Did the creator just mean the 1 C of milk? I don’t see how it’s a “mixture”. Is it blended with the rum? Hi, Amy. I’m so sorry for the confusion. It’s just milk you’re adding to the cake mixture. I’ve updated the recipe to be clearer.